The Moon is 0 – 45 degrees ahead of the Sun. There is no visibility at all to a thin crescent in the early evening western sky. The New phase is Active and Spontaneous. It is about self-discovery, beginnings and intent. This phase involves the emotional body. Passion, desire and excitement qualify the outcome of the cycle. At this stage, there is a minimum of awareness and knowledge. Innocence gives it a pioneering quality. The energy of this phase relates to sight, inner and outer. Since the whole picture cannot be seen, it can be a time of vulnerability and doubt. The function of this phase is to become aware of the intention; later there will be opportunities to revise and reorient. A visionary action is necessary during the New phase. This is the time to form your intent; see it first with your inner vision and then create a visual representation of it that can be viewed throughout the cycle. The question is: What do you desire? See yourself having achieved your goals. What does it look like and how do you feel? The idea is to let the goal become clear without concern about how it will be accomplished. It’s time to trust in yourself, your ability to learn and adapt, and your potential to manifest. Keywords for the New phase are beginning, birth, emergence, projection, clarity. It is the time in a cycle that you are stimulated to take a new action. During this phase, the new cycle is being seeded by your vision, inner and outer. Engage in physical activity. Spend time alone. VISUALIZE your goals for the 29.6-day cycle ahead. 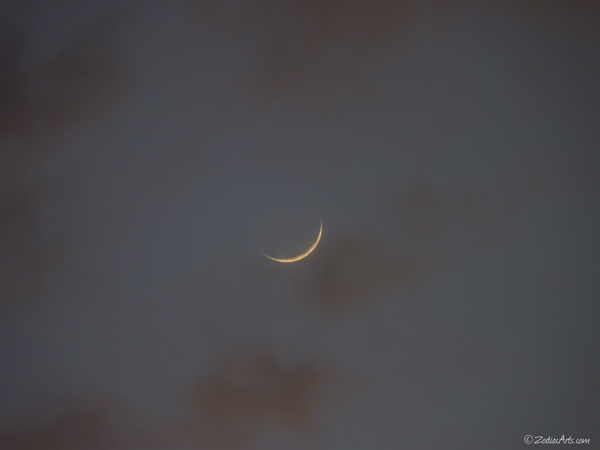 The slim crescent can sometimes be seen 1.5 days after the New Moon.